Games like Pocket Tanks have been around in some form or another for decades, on who knows how many platforms. Pocket Tanks itself has been around since 2001, and is now bringing a little slice of nostalgia to Android. The game certainly looks like it is over 10 years old but plays smoothly like a game that was made today -- and best of all is free to play. Jump into our time machine after the break and check out Pocket Tanks for Android. Pocket Tanks stays true to its retro lineage by providing the same graphical layout as the early releases, with some sweet 2-D graphics and basic sounds. The game plays extremely smoothly though, and navigating the menus, making selections and scrolling items feels like you’d expect for a modern Android game. There are both one and two player game modes, as well as target practice mode to hone your skills. In single player mode, you can change the CPU difficulty to try and match your own skill level. The gameplay of Pocket Tanks, if you’ve never played, is a turn-based tank battle game wherein you fire stationary tanks back and forth at each other to score points. You take turns going back and forth shooting different forms of projectiles, using the angle of your turret and the power of your shot to hit the other tank properly. There are a staggering number of different weapons to choose from, which you select at the beginning of each round. Again in a turn-based fashion, you go back and forth selecting one weapon at a time. Unfortunately there’s no easy explanation of what each one does except for in the settings -- it can take a long time to remember what each does. Speaking of settings, they allow for customization of most elements. You can change the sound and different aspects of the way the terrain is generated, as well as which specific weapons are available for use. 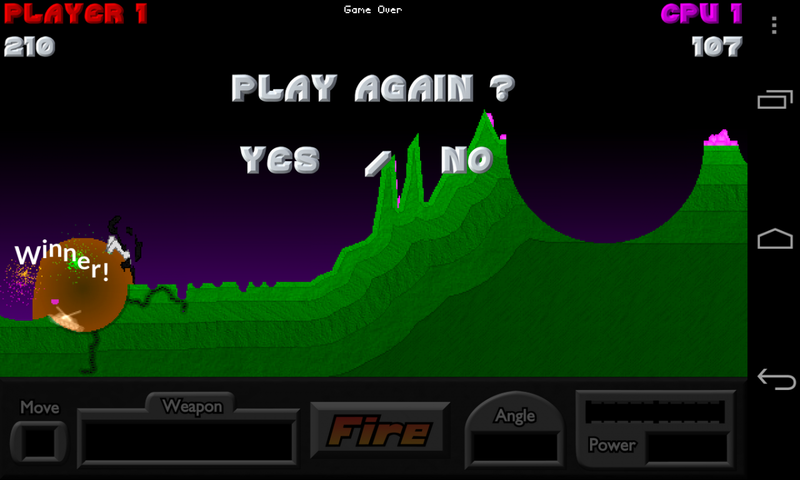 The free version of Pocket Tanks doesn't have any ads, but does have a limited set of weapons to choose from. This isn't necessarily a disadvantage to any player because both players select from the same pool of weapons, but it can make things a little stale. The "deluxe" version of the game is $4.99 to unlock dozens of new weapons, and there are also additional free and paid game extensions available if you're really into expanding the game. Once you do get ahold of the different weapons and the gameplay, you can easily spend hours upon hours on this game trying to get an optimal strategy. The gameplay can get a bit slow at times and could really benefit from a setting that quickly advances through the CPU’s moves (don’t care to sit and wait for it to “think” about a move) in single player mode, but that’s a small complaint. The two player pass-and-play mode is good for killing some time with a friend, because there’s nothing to “hide” from the opponent so you can play on the same device. Pocket Tanks is certainly worth a look if you want to take a walk down memory lane and play a retro arcade-style title. Best of all the game is free to play and plenty fun without the deluxe in-app purchase features. You can grab a download of Pocket Tanks at the Play Store link above.